A noun. A verb. A blog. 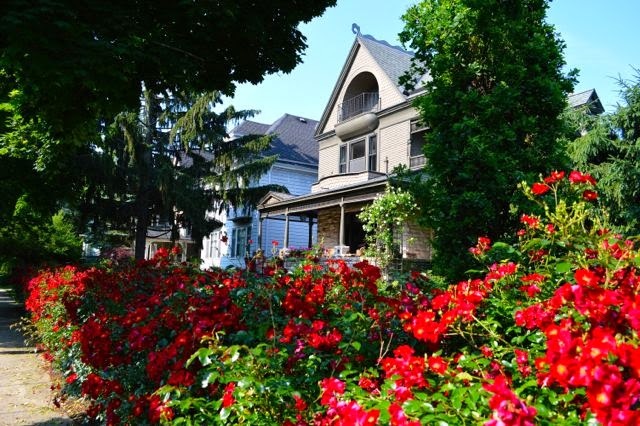 The Locke-Irey garden alone (seen here with a hint of Buffalo’s many charming streetscapes), will have as many as 4000 visitors over the Garden Walk weekend. If you’d told us five years ago that we would eagerly visit Buffalo, Buffalo!, as a garden destination, we might have looked at you sideways. That was before, through Twitter and other social media, we met amazing, hard-core gardeners who are actual Buffalonians. In 2010, the lid was blown off our outdated notions (Fire in North Tonawanda!) 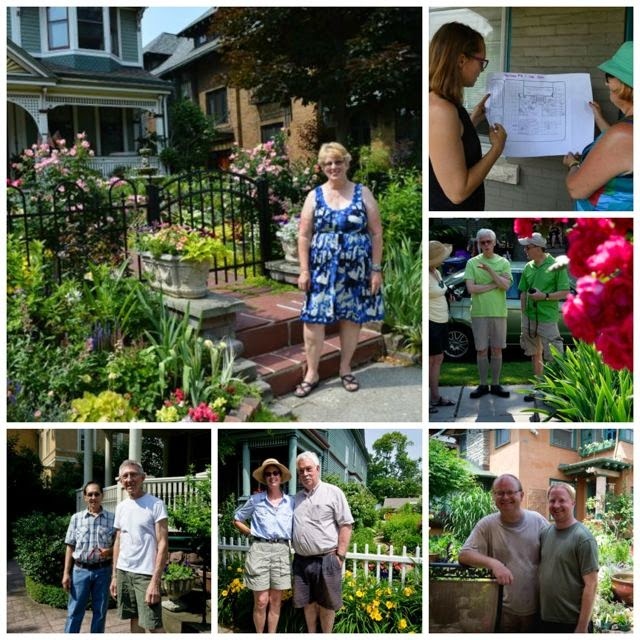 by visiting Buffalo on a Fling – a big annual meet-up of garden bloggers – as a preview of their annual Garden Walk, always on the last weekend in July. We immediately fell in love. A few of the hundreds of Buffalo gardeners who invite you to Garden Walk. Clockwise, from large shot: Jennifer; Claire (showing Sarah the plan for her part-garden/part-art installation); Mike (centre, chatting with Helen and Visit Buffalo Niagara veep Ed Healy); Gordon and Brian; Annabelle and Jim; Dom and Arlan. All graciously gave us a pre-Walk preview. 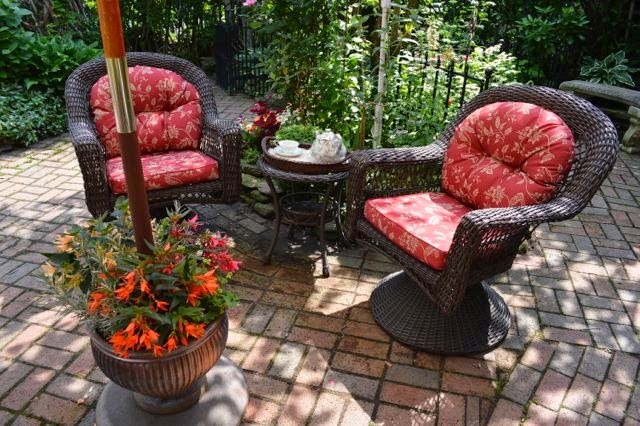 In 2014, the 20th annual Garden Walk features nearly 400 open gardens. Four hundred! And they’re all free to visit on the last weekend in July – this year, July 26 and 27. After visiting just a handful and chatting at length with the gardeners, we once again find ourselves more than happy to live so close to such a stellar gardening city. People in Buffalo are garden crazy. Toronto has a lot to learn from our neighbours to the ever-so-slightly south. 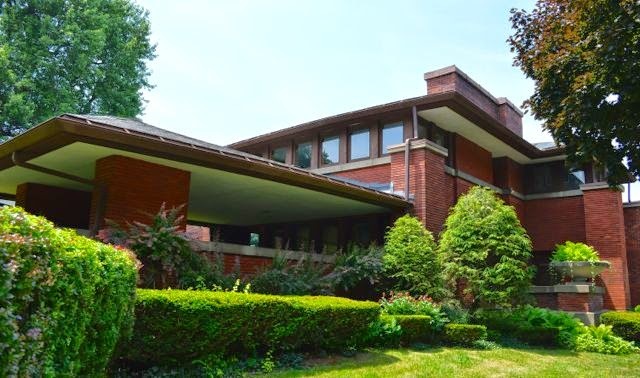 Oh, just another house designed by Frank Lloyd Wright. The Buffalo backdrop is really sensational, with its wide streets and planted boulevards, Olmsted-designed park system (he of Central Park fame), clusters of unique neighbourhoods, delightfully idiosyncratic architecture with brightly painted wood houses, and a Frank Lloyd Wright house or few thrown into the mix. Once upon a time, Buffalo was the wealthiest city in the United States, and it still bears that patrician bone structure. 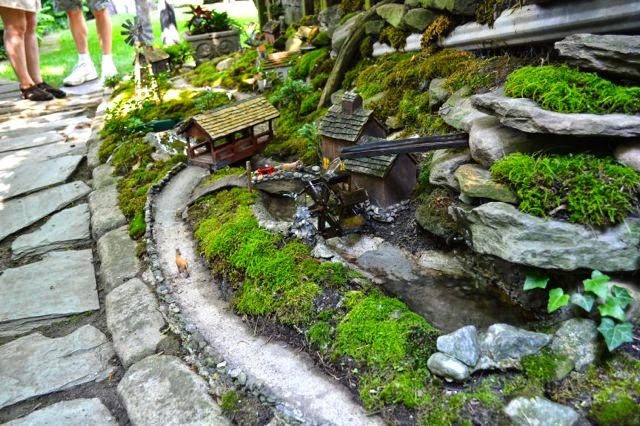 Arlan has opened his garden to the public for 19 of Garden Walk’s 20 years, and his miniature moss village is only one of the surprises there. We’re also ready to steal his idea for a greenhouse, which we’ll share later. In the gardens, we saw many ingenious solutions for common problems – like Arlan’s greenhouse, whose outer wall flips up like an awning to become a roof for sheltered deck seating. Great space-saving idea. Or the ways Jennifer used paint to turn inexpensive plastic pots into something special. Buffalo isn’t perfect by any means. However, it really is more than Toronto thinks it is, and Garden Walk, with the month-long garden festival leading up to it, has helped make it so. You owe it to yourself to think outside of the discount malls and get yourself downtown. Do it during Garden Walk, and you’ll want to return. Guaranteed. We certainly do! 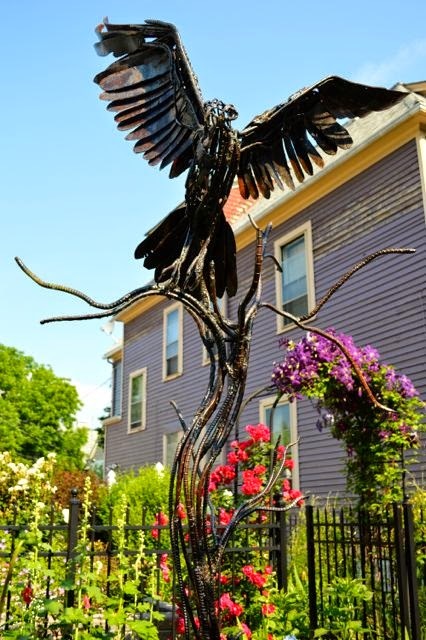 Where else would one buy a house, tear it down, and replace it with a garden, accented with art and open to the public – as Mike did? 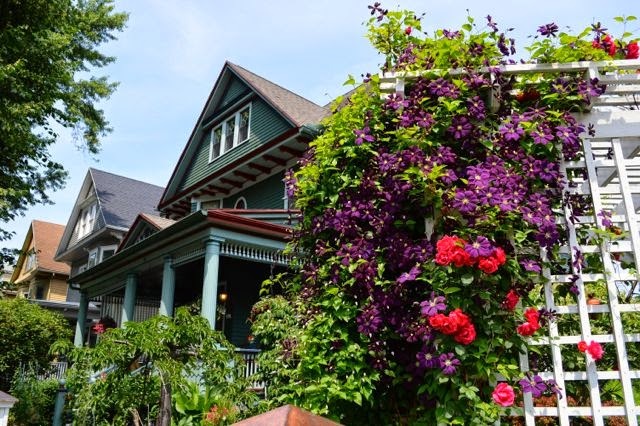 Buffalo, you’re our kind of gardening city. P.S. That isn’t an eagle, it’s an osprey. These are folk who relax in their gardens, and make them work hard, too. We love Gordon and Brian’s tiki bar. But just around the corner by the garage is a whole passel of home-made grow boxes full of peppers and tomatoes. Jennifer wanted an umbrella stand independent of a dining table. So she drilled a suitable hole in a planter, added a sleeve of tubing to protect the wooden umbrella pole and threaded the sleeve, pot and base together. Voilà! Made for the shade. By the way, she laid every one of those bricks herself. And there are many. Yes, she did. 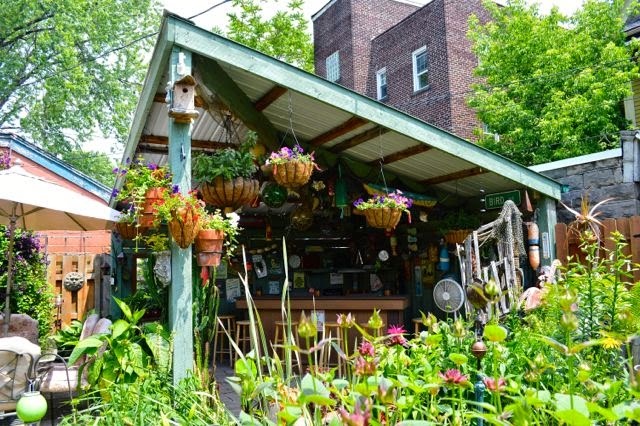 Over two decades of Garden Walk, Buffalo has developed a culture of gardening and its own style of garden – it’s great to see, and you should. So, get thee hence, and let’s bring some of that big garden spirit back to Toronto! Helen Battersby is a gardener, a writer, a power-walker and a garden coach, not always in that order! Thank you for your kind words and visit. Sorry I wasn't able to spend more time with you. Definitely, next summer, you'll see me in Toronto! If I lived closer I would definitely be thtere. It is a great event. Jim does a great job all year naking it such a big success! If you don't want to drive, consider getting together with your garden club, senior citizen's group or your friends and relatives and hiring a tour bus. There is no fee or ticket to buy for the walk. Stop for the day to check out the gardens, enjoy a meal and hop on the bus for the ride home. Helen, do you know of anyone (individual or group) willing to let me tag along on the tour? I live in Scarborough but can meet just about anywhere in GTA or on the way to the border. Hi, Anna, I don't know of anyone at the moment with a trip scheduled — speak up out there if you know differently. But why not organize one yourself with a few friends? The gardens are open from 10 am till 4 pm, Saturday and Sunday. It was fabulous to meet you at the Fling, Helen. :o) The Garden Walk sounds incredible! My son is moving to Buffalo in 2 years and I may have to visit him multiple times during the summer so I have time to see him and all these gardens! 400 gardens is just amazing! Who would have thought it about Buffalo ? You did a great job promoting these secret gardeners I knew nothing about Helen … I love the pictures .. what wonderful ideas and I can't believe she laid every brick! … the gardens are beautiful and the ideas are great … I wish I lived closer but having read this post the next time I hear Buffalo mentioned I will have a different image in mind! Never miss a post with our weekly roundup from Toronto Gardens, right in your inbox. 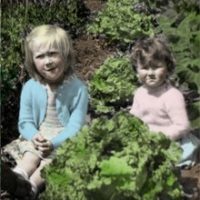 Toronto Gardens is from the muddy hands of Helen Battersby and Sarah Battersby, sisters and neighbours who come from long lines of English gardeners. We garden in Toronto's east end, but poke our green noses into growing spaces all over. Drop that trowel & please add your comments!